cards in the mail. Whether you're writing a letter or a Christmas card, use this month as a chance to give someone a surprise by sending them something that isn't read over via the screen on a computer or phone. There are military members stationed all over the world who receive little to no mail and could use a little pick-me-up. Send letters thanking them for their service and let them know you appreciate what they're doing. Two sites you can do this through are Letters to Soldiers and Operation Gratitude. If possible, send a treat or two along with each of your letters. I'm seriously picky with my stationery, but there are two places in NYC that never fail to disappoint. The first is Kate's Paperie located on Broome Street. Whether you're looking for casual or elegant stationery, they likely carry what you're looking for. Another place is Papyrus. They carry a huge variety of stationery including Kate Spade Cards, gift sets, and one of my favorite items, the beautiful La Belle Vie Thank You Notes – J'adore! When you want to add a little flair to your writing, consider taking calligraphy classes in NYC. Although I have yet to take classes and have only done some learning on my own, I've had pleasant interactions with those at Society of Scribes. I've had a few questions and I never failed to get a quick, pleasant response. They offer a variety of classes and workshops such as "Gothicized Italic" and "An Introduction to the Art of Calligraphy." If you've never read "Chicken Soup for the Soul" books, you're missing out. They're wonderful collections of stories, poems, and letters written to, from and about others. Celebrate Write to a Friend Month by reading some of the books that include letters between friends. Some excellent options include "Chicken Soup for the Girlfriend's Soul" and "Chicken Soup for the Teenage Soul: Real Deal Friends." Should you feel inspired, consider passing them along to friends to read. If you're in NYC, check Barnes & Noble and Strand Book Store to see what copies they carry. The obvious way to celebrate Write to a Friend Month is to actually put pen to paper and write to someone you haven't spoken to in awhile. Regular white lined paper is fine, but considering how rare it is that someone gets a handwritten letter, make it extra special by writing a letter on a beautiful piece of paper or in a decorative card. Once you start writing letters, think about keeping it up with a few friends rather than using email. It's appropriate that Write to a Friend Month is in December considering there's quite a few Christmas cards that need to go out. 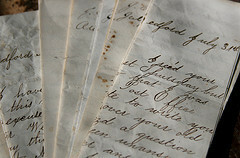 Use both occasions as an excuse to start writing more letters and rely less on the instant gratification of technology. Photo copyright belongs to Muffet via Flickr.